Afternoon tea and a mystery to solve! What's not to love? Our murder mysteries make afternoon tea even more special - it's just like being in a Miss Marple drama. Choose your murder mystery theme and turn your guests into suspects or detectives with one of our Join In Whodunits. Our murder mysteries make it so easy for your guests to step into character within minutes and in no time they'll be having more fun than anyone else in the room while the detectives bid to uncover the clues from the false trails to work out just whodunit. 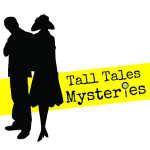 We bring along detective props and case files to add to the fun and one winning team earns a fabulous boxed murder mystery to take home and play. From large venues to bijou settings we can make afternoon tea and a mystery work wherever you are and whatever the occasion. A bookmaker is found dead in a horse racing yard and that's not good news for anyone! Judging the cake stall at Mocksomer's village fete is murder!